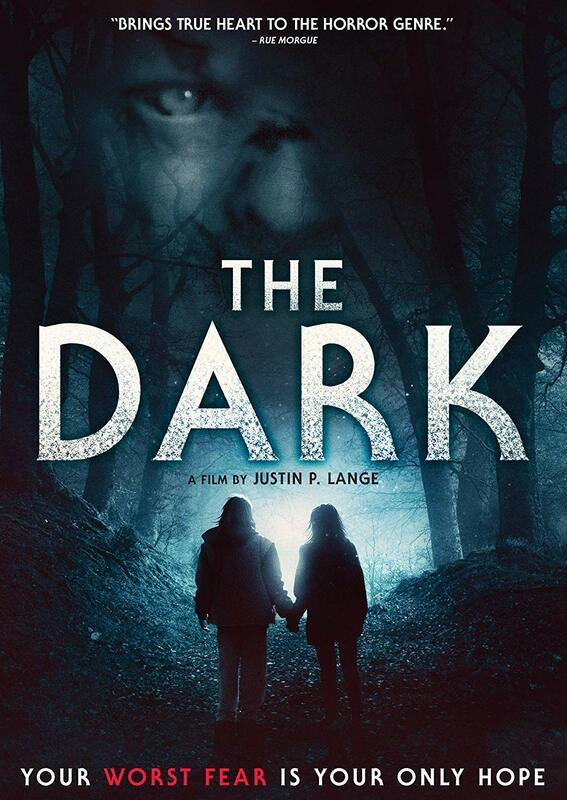 Another horror movie out on DVD today is the festival darling The Dark. With a bit less hype than the prolific Blumhouse studio fare, The Dark is well worth a look. It’s a gritty little first time horror film that remains unpredictable because of so many unknown factors. Mina (Nadia Alexander) haunts a forest. She’s vicious with an axe and acrobatic in the trees. When she discovers Alex Whitman (Toby Nichols), blinded and in the back of a car, she becomes his protector. There are so many forest based horror films, from The Evil Dead to The Blair Witch Project, it’s a clever twist to make The Dark from the “monster”’s perspective. We get a glimpse of Mina as a neglected kid in a house but still wait to piece together how she ended up here. Mina knows her own legend and embraces it to scare off other meddlers. Alex’s story is heard more via supporting characters who are on the lookout for him. It creates an interesting dynamic with Alex because she killed Alex’s kidnapper, and tries to convince Alex he’s dead without revealing that she killed him. There are hints of Stockholmy codependence there. By the time both Alex and Mina’s stories are revealed, they have a lot in common. It’s not to say they are better off in the woods, but it’s understandable how they each ended up there. The widescreen frame gives The Dark the scope of the old John Carpenter horror movies. And though the two leads are teens, all the other characters are adults, making this a grown up horror movie. Everyone else is trying to deal with a real life situation and they just have no idea what they’re really up against. Mina is the terror of the sort adults can’t control, and that’s scarier than something in the woods attacking incompetent teenagers. Mina could be a franchise. Whether she meets new people each time or just haunts the woods against people who deserve it, we’ll definitely want to see more of her. Alexander creates a memorable, sympathetic slasher icon, and Nichols her vulnerable mirror. Writer/director Justin P. Lange came up with a clever, mature twist on the stalker in the woods genre. Even if he doesn’t intend Mina as a franchise, it’s worth seeing his first film and following whatever he decides to do next.